New York, NY — Wednesday, October 10, 2012 marked the launch of Hayastan All-Armenia Fund's 15th International Telethon campaign. The live 12 hour program is set to air on Thanksgiving Day, November 22, 2012 and will raise funds for the construction of Multifunctional Community Centers in the remote villages of Armenia, including Artsakh. The community centers will house first aid clinics with an ambulance, computer rooms connected to the internet, an auditorium for trainings and town hall meetings, a library with audio visual equipment, as well as an administrative and accounting office. The dinner reception, hosted at the House of Armenia in Glendale, attracted long time donors and supporters of the Fund. 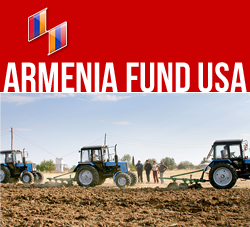 The event has become a tradition where the official logo of the telethon is unveiled, kicking off the campaign and rallying the greater Armenian-American community around one mission: to help strengthen Armenia. The honor of unveiling the official Telethon 2012 Logo, designed by Los Angeles based graphic artist Edik Balaian, was given to Mr. Ara Vardanyan, Executive Director of Hayastan All-Armenian Fund and Mr. Ara Aghishian, Esq., Chairman of Armenia Fund U.S. Western Region. Present at the event was the Honorable Grigor Hovhanissian, Consul General of the Republic of Armenia in Los Angeles, Archbishop Moushegh Mardirossian, Prelate of the Western Prelacy, Archbishop Vatche Hovsepian, former Primate of the Western Diocese of the Armenian Church, as well as the leadership of major Armenian-American organizations, who are also members of the Armenia Fund’s Corporate Board.